With its wonderful on-site marina, Donner Lake Village puts you within quick reach of the best Donner Lake water sports. Enjoy the open water with stand-up paddleboards, hydrobikes, jet skiis, kayaks and a variety of motor boats. Anglers will have the time of their lives hooking Mackinaw, brown and rainbow trout, while children will love splashing around in the lake's fresh, cool water. Located just outside the hotel, Donner Lake offers a wide array of outdoor recreational fun and a stunning backdrop for a vacation at the area's only lakeside lodging facility. Pricing varies based on specific watercraft and rental periods. Rentals available for full days, half days and by the hour. For specific pricing, visit www.donnerlakemarina.com. Rentals available during daylight hours.Fishing is legal one hour before sunrise to one hour after sunset. What is the age minimum to rent jet skis? 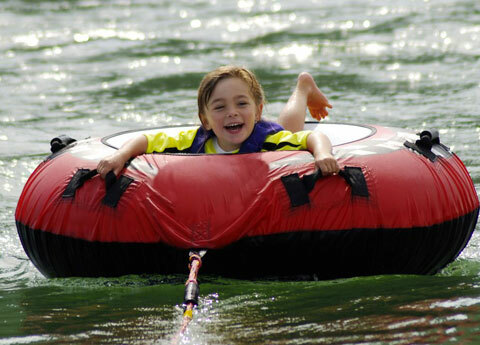 For rules and regulations associated with lake rentals, contact Donner Lake Watersports at 530-582-1999. What kind of boats available to rent? Guests can choose from a variety of rentals, including 23 foot Centurion Enzo Wakeboat for up to 12 passengers, 19 foot Runabout 7-9 passengers, 23 foot Pontoon boat for up to 13 passengers and 14 foot Aluminum fishing boats.